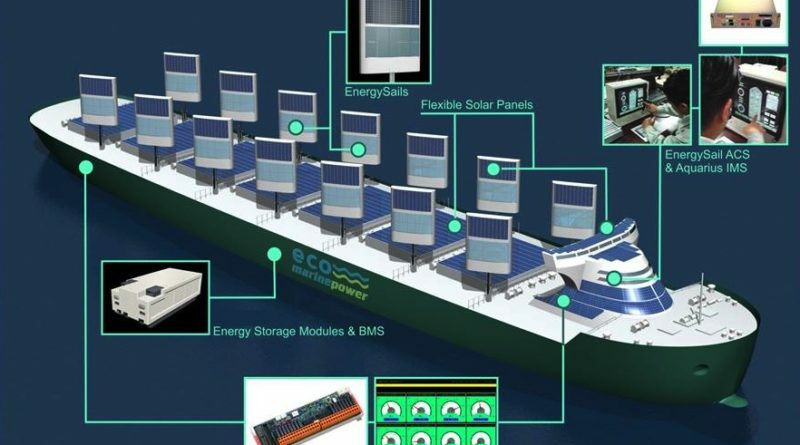 FUKUOKA, Japan — Eco Marine Power (EMP) announced in late July it has begun preparing for sea trials of its Aquarius Marine Renewable Energy (MRE) solution in co-operation with strategic partners and ship owner Hisafuku Kisen K.K. of Onomichi, Japan. The MRE solution would ultimately lead to the first-ever installation of a rigid sail and solar power system for ship. Such technology could be a sustainable solution for maritime shipping operations, the team of EMP and Hisafuku Kisen K.K. believe. A feasibility study involved large bulk carriers, such as Belgrano, Bulk Chile and Nord Gemini, is currently underway. The study would help determine the amount of propulsive and solar power each vessel needs. One ship would be selected for sea trials after the feasibility study is complete.